David and I celebrated our third anniversary yesterday. We didn't make a big deal out of it, other than going to the Crow's Nest, probably the best restaurant in Anchorage, for dinner. And here we pause for a slight rant: why would a top-quality restaurant oversalt its food? I like salt as much as the next person, and it definitely has its place in seasoning and finishing food, but oversalting a high-quality pepper steak AND its side of wild mushrooms is insane. And now we return to our previously scheduled programming. This is also the 100th post on this blog. If I were more organized today, I'd have a giveaway or something special planned. Watch for that in the next post. Tomorrow at sundown, Passover starts. Since I haven't been home much this week, I still need to quarantine any products with chametz (breads, crackers, rice, beans, cereal, etc.) --anything with leavening or that puffs when it cooks. Passover seders are typically held the first and second nights, but due to some guests' scheduling quirks, we are holding ours on Sunday evening. One of our guests is vegan and five are vegetarian. It should be a fascinating menu--stay tuned on that too. In the interest of clearing out some of the chametz before Passover, I give you this onion focaccia. Made with some of the time-saving shortcuts I talked about here, this takes less than fifteen minutes of active time and may have been the best focaccia yet. It's just the right amount of onion-y, and the onions soften and mellow during baking, making it the perfect accompaniment to pasta or a roasted meat. Warm the milk on the stove or in the microwave to 100 degrees. Cool the warmed milk for a minute, then add the yeast and stir to dissolve. Set aside for about fifteen minutes; it should begin to foam. In a stand mixer using the dough hook attachment, combine the flour, two tablespoons of olive oil, the yeast mixture, the water and the kosher salt. Mix on medium until the dough is smooth and elastic, about five minutes. Warm your oven to 180 degrees. While it is warming, take the mixer bowl off the mixer, dust the top of the dough with all-purpose flour and seal tightly with plastic wrap. Turn off the oven and place the bowl in it. Let the dough rise until it is about doubled, about half an hour. Flour a work surface and tip the dough onto it. Using your hands, shape the dough into a rough square, then bring each of the corners to the center. Turn the dough over and tuck the ends in so the dough is circular. Cover loosely with plastic wrap and leave it on the counter to relax, about half an hour. While it is relaxing, preheat the oven again. Prepare your baking pan--I used a small paella pan, which worked perfectly. Brush the pan with two tablespoons of olive oil, include the sides. Then pat the dough into the pan using your hands. 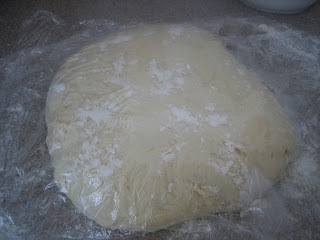 Turn off the oven, cover the plan loosely with plastic wrap and allow the dough to rise one more time. This should take 30-40 minutes. Remove the pan from the oven and preheat to 500 degrees. Sprinkle the remaining olive oil over it and evenly distribute the onion rings. Let the dough sit on the counter for a few minutes to allow it to continue rising around the onion rings, as shown here. Press fingers lightly into dough to create dimples in it and sprinkle the flake sea salt on top. ﻿Bake for about fifteen minutes, until the edges of the bread turn light brown. Do not overbake--the bread may look slightly underdone, but it will have great texture. Remove from the oven, cool slightly and cut into wedges. Makes 10 to 12 good-size focaccia wedges. Happy anniversary!! And congrats on your 100th post! Isn't it terrible when a great restaurant over salts? Drives me a little crazy! Good look with your vegetarian/vegan passover! I wouldn't know where to start! This focaccia looks incredible! And it's right up my alley with all of those onions!! YUM! Congrats on two amazing anniversaries!! This focaccia sounds great!! I wanna dunk it in a big bowl of soup!! The onion focaccia looks awesome! Sorry to hear that your unhappy experience with a top quality restaurant...could it be that your order was prepared by a trainee? Congratulations on your anniversary and the 100 post mark for your blog (I love the milestones). Happy Anniversary! That is so lovely. I have to admit to being a salt fiend. I grew up with a mother who put salt on radishes, and made french frie sandwiches. Sad but true. Congrats on 100 posts! Yah, that is fantastic. Such a milestone. You must celebrate. Crack open some bubbly and toast yourself for a job well done. And this focaccia, to die for. Love onions so this would get gobbled up right quick in my household. Had to check out the focaccia. I have wanted to try to make some. I will follow your lead here. Congrats too! I think the one thing that intrigues me here is the raw onion on top. I think I prefer this better than the carmelized stuff! You focaccia does look so fluffy in the pictures-yum! Congrats on the 100th mark and happy 3rd anniversary. Sorry your restaurant trip included a salt spill on your steak! And I hate when restaurants oversalt - why ruin high quality ingredients?? Happy anniversary! And congrats on your 100th post! Onion focaccia looks amazing. Happy Anniversary to you two, and congrats on 100th post! Whoo hoo! Delicious Focaccia! 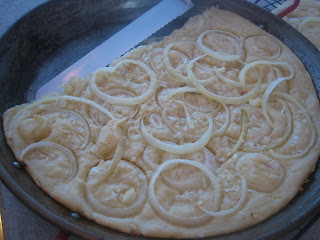 I love onion focaccia but haven't tried to make it on my own yet. I'll add it to the to-do list :) Vegetarians for Pasach...hmmm. I'm thinking about my mom-in-law's typical menu and I guess the chopped liver, gefilte fish, lamb and brisket are out :) How about a kugel (with Passover approved noodles)? I'll be curious how you worked it out. Happy holiday! "Best focaccia yet"? That is a high claim! I will give this a shot! Good luck on pleasing all the vegans and vegetarians! I know you will pull it off. Focaccia is one of my favorite types of bread and this looks great! The onions must give it great flavor! Your focaccia looks wonderful. Sounds like you've got a lot to celebrate - congratulations! Congratulations for your anniversary and your 100th post. The onion foccacia looks great. Happy anniversaries!!!! Sorry to read that your anniversary dinner wasn't perfect, but then I'm sure it's always hard to get better food than you cook at home. 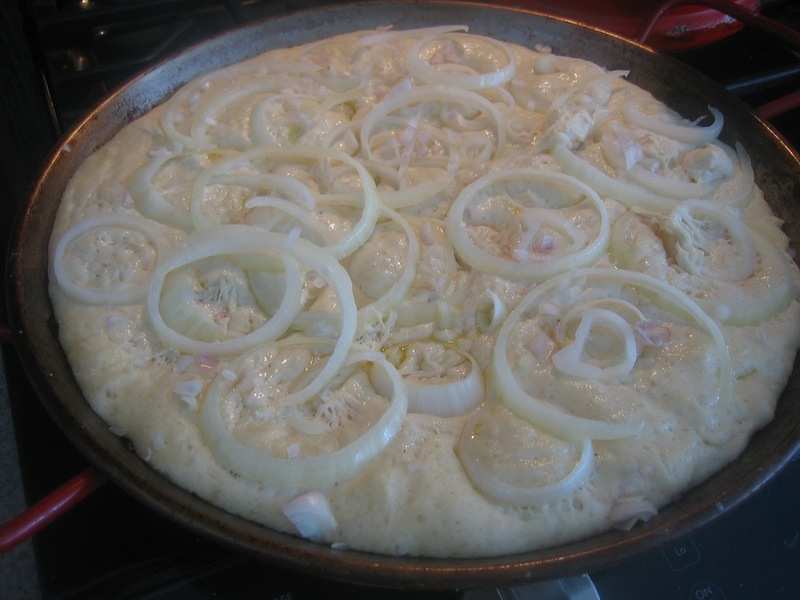 Your onion foccacia sounds great! I love it that you let the onion cook with the bread. I bet that yields an awesome flavor throughout! Great recipe! Happy anniversary to both of you. Along the years of cooking, I have reduced the amount of salt into food and now it seems find even with a minimal of it. Thats a nice flavor into the foccacia and onions?? I can have loads of so, its another try out for me. Aw Happy Anniversary! And congrats on your 100th post! Great week for you :) This focaccia looks awesome too! Homemade focaccia is such a treat in my house, my dad's always trying to get me to make more! I love the simple onion flavor of yours, thats always the best, I'll have to give this a try next time! I agree with you on the over-salting. That's one of my biggest pet peeves. I'd rather then under salt of anything - I can always add more myself! Happy Anniversary to you both and your 100th blog post, how cool. I love focaccia and adding onions makes it even better. Have a wonderful weekend. Congrats on your 100th post! This onion focaccia sounds like my kind of focaccia :) I love me some onions! Happy Anniversary! 110th post - awesome! And your foccacia looks fantastic too! There's a lot packed into this post. Happy anniversary, happy blogiversary and I will await your vegan menu! Happy Passover. If I was feeling better I would prepare a seder tonight. really healthy n yummy one.looks nice.congrats dear. Happy Anniversary! 110th post We love foccacia and it's a best bet every time !!!! First off Happy Anniversary and congratulations on your 100th blog post! It sounds like your passover dinner should be very interesting with so many dietary requirements! Happy Anniversary! Foccacia looks delicious! Happy anniversary to you!!! It was a great week to get married, wasn't it? Your focaccia looks wonderful! And now I'm curious what you serve for a meatless passover dinner? This focaccia looks yummy! Happy anniversary to you! The focaccia sounds great. And I agree...I would rather have a restaurant put salt shakers on their tables and use less salt in their cooking. You can add but you can't take away. Happy anniversary .. and happy passover! Yummy foccacia! Happy anniversary to you and your husband and to your blog! May you be blessed with many more!! Congrats & happy anniversary! BTW, your blog is doing some funky stuff layout-wise on my IE/FF browsers, it's like it's shifted down. Happy anniversary and Congrats on your 100th post!